Happy New Year, everyone. I hope 2016 is a wonderful year for you, filled with good times and many good games. I was invited by a friend of mine, Doug, to throw down a game of Fistful of Lead at a Boy Scout overnight event. I said yes, packed the game into my truck and headed to the event location. 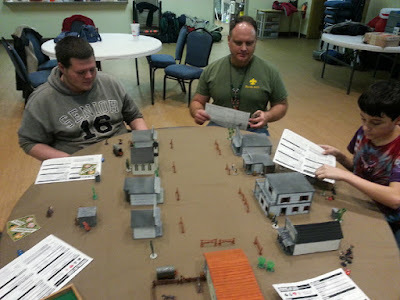 The game was the standard plot line: A gold shipment has arrived in Deadrock, but the cavalry from the nearby fort can't pick it up until tomorrow. 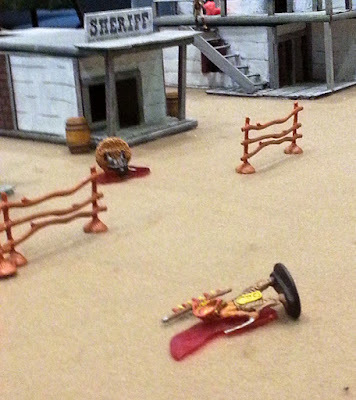 The Sheriff and his deputies have hidden it somewhere in town and will defend it to the bitter end. 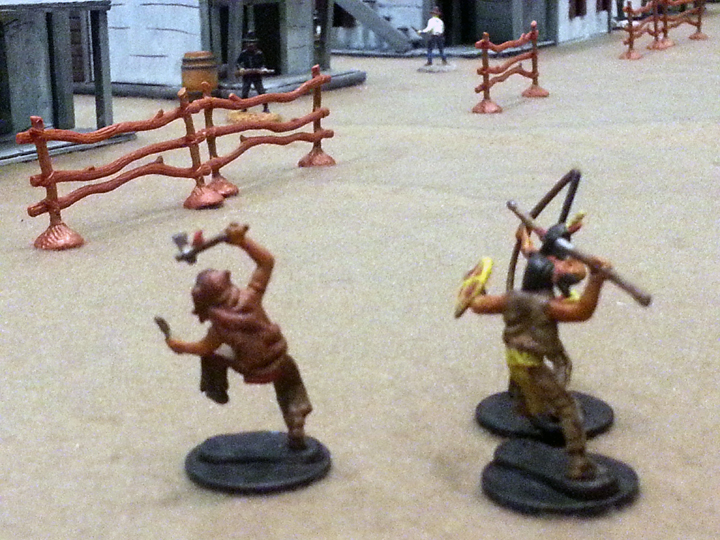 Your gang, and every other gang of varmints within spitting distance of Deadrock, want that gold. Only problem is y'all hate each other and wouldn't mind taking out a few enemies in the process! 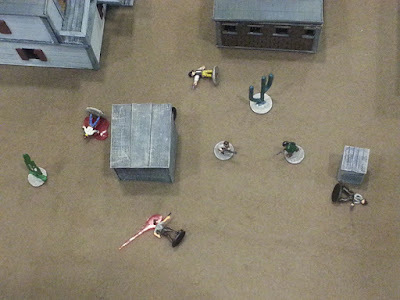 Get the gold, kill anyone who gets in your way and get off the table with the loot. Easy, right? 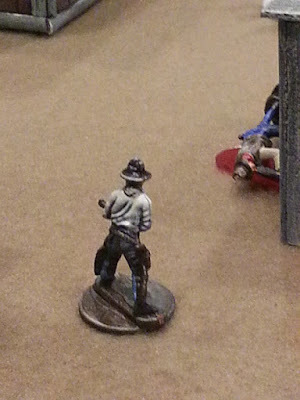 I had five players, thus four gangs and the Sheriff (Doug). The boys didn't really name their five-man gangs, so I'll take the opportunity to do so. There were the Gringos (Mexicans), Injuns, Longriders and Gents. They all started at the edge of the table and worked their way into town. Everyone hated the gang to their left and more points were given to players who could kill their rivals. The guys at the start of the game. Doug's in green. Immediately, the Sheriff's crew and the Gringos went after the Gents. It didn't take long for their leader to be shot in the back while exploring a shack. The Gringos moved as a unit, straight toward the Gents and Sheriff. Their inadvertent teamwork (the Gringos and Sheriff) really put the hurt on the Gents. Soon, the Gents were fighting for their lives on two fronts. That is never good in a gunfight! 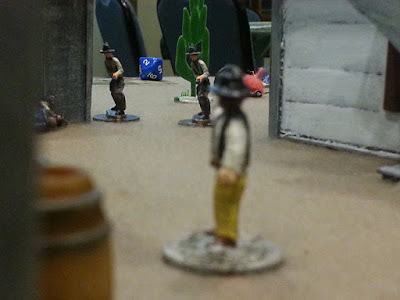 A Deputy takes on "The Twins" from the Gents gang. Meanwhile, the Longriders methodically checked buildings for the gold while avoiding getting into a scrap with another gang. 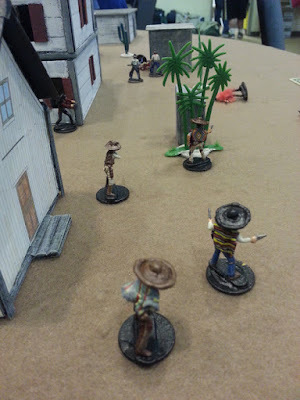 They managed to search about a quarter of the town before they were forced to make their presence known to the other gunslingers. 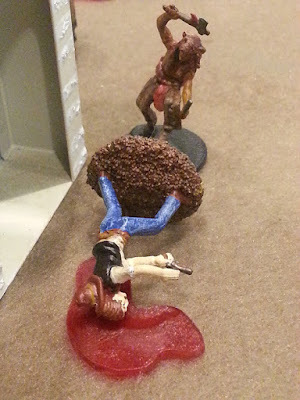 That's when their day went South. They got strung out and didn't support each other, letting both the Sheriff and the Gringos whittle down their ranks. The Injuns, many of whom had either short-range throwing or melee weapons, skirted the northern edge of town, searching for the gold. They boldly ran en masse across Main Street. 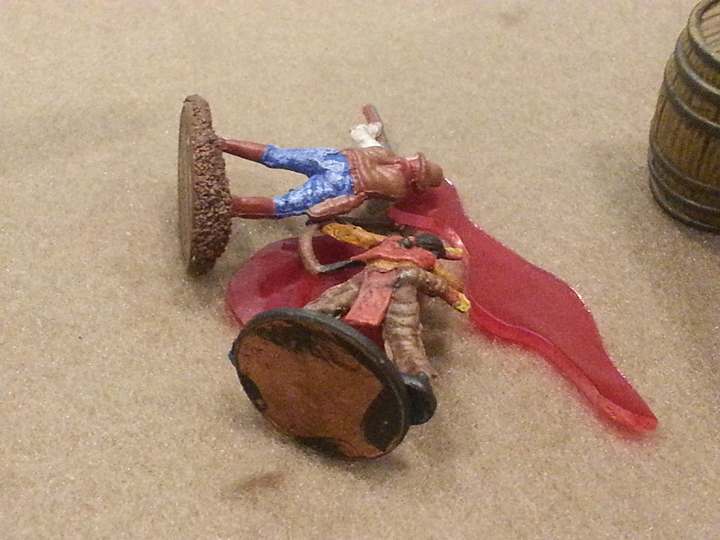 That went well for most of them, but unfortunately Chief "Big Red" didn't make it. The Longriders retreated, but that move only allowed the Injuns time to move in and do what they do best: Hand-to-hand mayhem! It eventually devolved into that Fistful of Lead always becomes...a bloodbath. The Northeast part of town became "blood alley", but there were plenty of other places where atrocities occurred. The beginning of "Blood Alley"
Eventually, the Gringos received a tip from a townswoman that the Sheriff hid the gold in the jail. 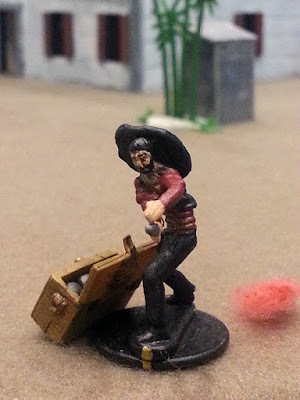 They finished off the Gents, pinned down the Sheriff and his deputies and found the gold. 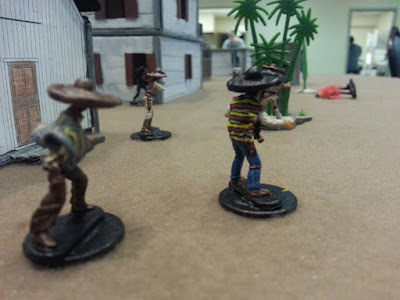 The other gangs tried to stop them, but the Gringos were not to be denied. Not only did they have the most kills for the night, but made off with the loot! The lads said they had a great time and there were plenty of moments where what was happening on the table directly translated into stories they can fall back on for many years. Fun times! I'd gladly volunteer to host a game with the crew of Troop 260! Great game. Thanks again for running it for us.